Sparked by a conversation this past weekend about the usefulness of the half-angle identities, I constructed geometric proofs for and . Since I’ve never seen these anywhere before, I thought I’d share. And while I was at it, I thought I’d share all my other geometric proofs, so here they are, posted mostly without comment. Some of these are so well-known as to be not worth mentioning. Many of them have been stolen from Proofs Without Words I or Proofs Without Words II. I came up with a few of them myself. Frustratingly, almost none of them are to be found in Precalculus textbooks, where they might be learned and appreciated. Partially because of the way it naturally generalizes into the proof of the derivative of sine. If you just let approach 0, approaches 1 and that point in the interior of the circle ends up on the circle, where merges with itself. And finally, one that shows that the sum of a sine and cosine function of the same argument is also a sinusoid. Since I lost the original picture and don’t feel like remaking it, you’ll have to complete the proof on your own! Update: After some feedback on twitter, I’ve decided to add a few more diagrams. Tim Brzezinski sent me a link to his website of geometric proofs of trig identities and he had some that I’ve never seen before. I’ve taken two of his diagrams and added them below. How many ways can you color an icosahedron with one of n colors per face? If you think the answer is , that’s a good start–there are choices of color for 20 faces, so you just multiply, right?–but that’s not correct. Here we’re talking about an unoriented icosahedron that is free to rotate in space. For example, do the three icosahedra above have the same coloring? It’s hard to tell, right? 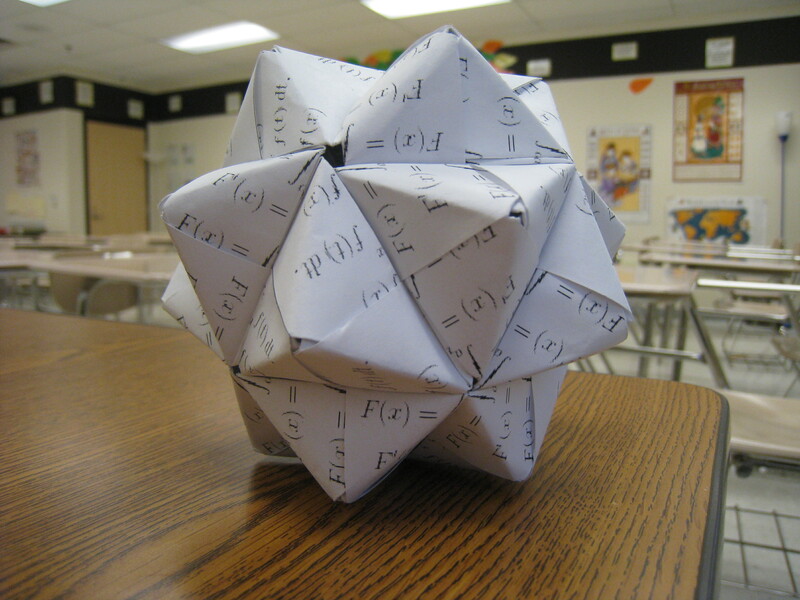 Solving this problem requires taking the symmetry of the icosahedron into account. In particular, it requires a result known as Burnside’s Lemma. For the full solution to this problem, I’ll refer you to my article, authored together with friends Matthew Wright and Brian Bargh, which appears in this month’s issue of MAA’s Math Horizons Magazine here (JSTOR access required). I’m very excited that I’m a published author! Yes it’s true. I’m writing about trapezoids again (having written passionately about them here and here previously). I’ve been taking a break from blogging, as I usually do in the summer. For us, school starts in just two weeks. So I thought I’d come out of my shell and post something…and of course I always have something to say about trapezoids :-). Let’s start with the following easy test question. Don’t peek. See if you can answer the question without any help. Which of the following quadrilaterals are trapezoids? So the test question above was easy, right? Quadrilaterals (A) and (C) are trapezoids, I hear you say. Not so fast!! If you’re using the inclusive definition, then the correct answers are actually (A), (B), (C), (D), and (E). But it gets better: If you were using the the exclusive definition, then NONE of these are trapezoids. In order for (A) and (C) to be trapezoids, under the exclusive definition, you must prove that two sides are parallel AND the two remaining sides are not parallel (and you can’t assume that from the picture…especially for (C)!). Can you see the absurdity of the exclusive definition now? 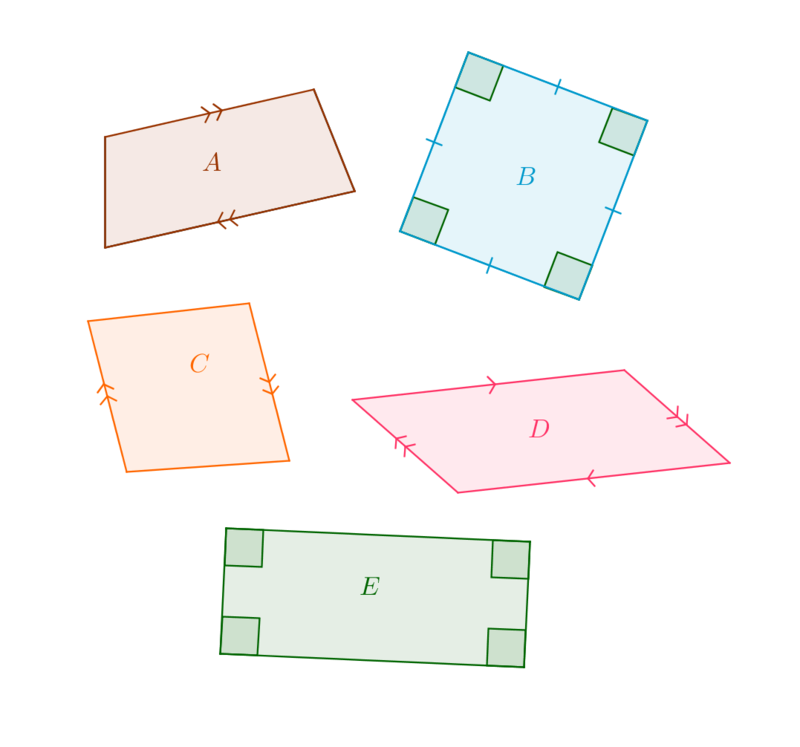 All other quadrilaterals are defined in the inclusive way, so that quadrilaterals “beneath” them inherit all the properties of their “parents.” A square is a rectangle because a square meets the definition of a rectangle. Likewise, parallelograms, rectangles, rhombuses, and squares should all be special cases of a trapezoid. The area formula for a trapezoid still works, even if the legs are parallel. It’s true! The area formula works fine for a parallelogram, rectangle, rhombus, or square. No other definitions break when you use the inclusive definition. With the exception of the definition that some texts use for an isosceles trapezoid. Those texts define an isosceles trapezoid has having both legs congruent, which would make a parallelogram an isosceles trapezoid. Instead, define an isosceles trapezoid as having base angles congruent, or equivalently, having a line of symmetry. When proving that a quadrilateral is a trapezoid, one can stop after proving just two sides are parallel. But with the exclusive definition, in order to prove that a quadrilateral is a trapezoid, you would have to prove two sides are parallel AND the other two sides are not parallel (see the beginning of this post!). You know about flat donuts if you played a computer game in which when you go off the screen at the left, you return coming in at the right, and similarly when you go off the screen at the top, you return coming in at the bottom. Mathematicians call the rectangle of your computer screen a flat torus. The word “torus” reminds us that we are only thinking of the surface of the donut. What does that computer screen have to do with a torus? Stretch the screen around a torus as this picture begins to show. Although a flat torus and a torus have the same topology, they do not have the same geometry. Geometry is about measuring space. In particular, on a flat torus, the shortest distance between two points is always a straight line. But on a torus, the shortest distance between two points staying in the torus is never a straight line. Is it possible to paste the opposite edges of the flat torus together in such a way that the resulting thing in 3D has the same geometry? That is, such that straight lines are still straight? It is easy to take one step, to create a cylinder, by pasting together just one pair of opposite edges. Notice that no stretching is involved at all. How about pasting both pairs of edges? My intuition says that such a thing is impossible. But only 11 months ago did we have a picture of what the resulting flat torus would look like. Here’s a news article with a computer-generated picture to illustrate it. Find nine 14-minute videos on geometry here. They’re breathtakingly beautiful!. Each video starts very simply and gets harder, but the computer graphics are so incredibly stunning that you will stay for the pictures even after you lose the narration. They are somewhat cumulative. Don’t jump into the middle. Number 9 can be watched at any time. The authors recommend last or second. Decorating for fall? 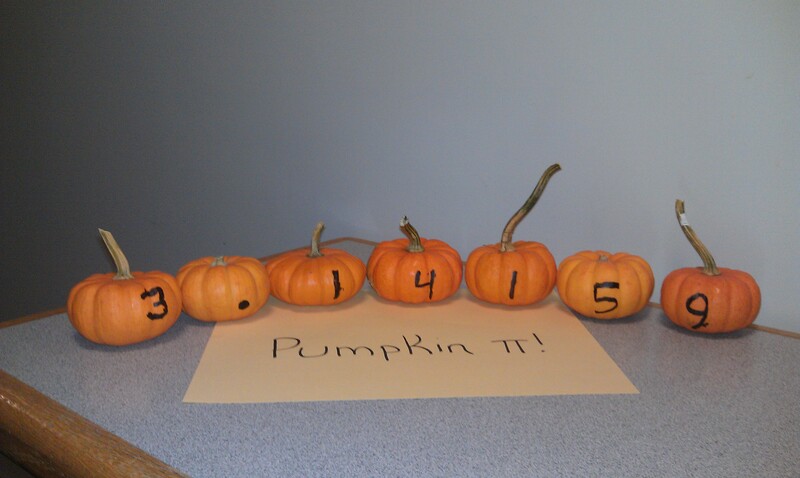 Consider creating some beautiful DIY pumpkins with a mathematical flair–perfect for on top of the hearth or next to the porch swing out front :-). These were created by Messiah College students (my alma mater) and the photo comes by way of Professor Sam Wilcock, my advisor. Go Falcons! Welcome to Mr. Chase’s Blog! What is a Point of Inflection?